From the days corporate social responsibility (CSR) became a topic of discussion, extensive amount of research is conducted on CSR in Western countries but still there is relatively little focus on some developed and developing countries. Moreover, relatively little research has compared cross-country and cross-sector CSR variations. 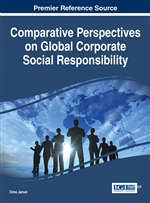 Starting from this point, this article investigates the extent of CSR variations of a highly developed (the United States), a developed (South Korea) and a developing country (Turkey) through a detailed comparative analysis of CSR information disclosure on corporate websites of 50 CSR active companies listed in stock exchange markets of each country. For cross-sector comparison, these target corporations are selected from five different industries including consumer electronics & telecommunication services, automobile & component manufacturers, food & beverages, retail stores, and major banks. The research opens the door for more in-depth empirical study on why there are cross-country and cross-sector variations in CSR. With the force of globalization shaping business practices worldwide, there has been a strong push to incorporate the values and principles of corporate social responsibility (CSR) into the strategic and operational processes of many local and multinational corporations. A myriad of forces has propelled companies to adopt a strategic CSR mindset and to develop a set of related programs to make CSR a practical reality. Some of these forces include industry and country-specific regulatory initiatives, calls from international organizations such as the World Bank, OECD, IMF and the United Nations (Jenkins, 2005; Hafsi & Farashahi, 2005), a rise in socially responsible investing and ‘standard-setting’ institutions for CSR reporting (e.g., SRI index, Global Reporting Initiative), and increasing pressure from governments, consumer watchdog groups, NGOs, and concerned citizens (Aaronson, 2003; Fombrun, 2005). Fundamentally, CSR has strongly entrenched in the corporate mindset of Anglo-American corporations (Robertson, 2009), however with the increasing presence of multinational companies across the world - many of them originating in the Western industrialized countries - has led to the adoption of many CSR practices in other developed and developing countries. Despite the global push toward CSR, the degree of commitment to which companies in different countries embrace the CSR concept and its practices is strongly influenced by national context - namely, the confluence of economic (Chapple & Moon, 2005; Robertson, 2009), social (Baughn et al., 2007), cultural (Welford, 2004, 2005), political-legal (institutional) (Campbell, 2007; Matten & Moon, 2008), and religious (Agle & Van Buren, 1999) forces impacting local business practices (Jamali & Mirshak, 2006). This global push toward social responsibility makes corporations practice CSR at some level and since messages regarding corporate ethics and social initiatives have the power to evoke strong positive reactions among stakeholders (Morsing & Schultz, 2006), companies share this information through corporate websites. Hence, corporate websites have become important tools for understanding the difference between countries and industries in the degree of commitment to CSR since they provide official perspective regarding CSR within the corporation for all its stakeholders (Wanderley et al., 2008). Although a great deal of research has been conducted on CSR in Western economies, there is relatively little focus on Asian countries (but see Baughn et al., 2007; Chapple & Moon, 2005; Welford, 2004, 2005) and even less focus on countries in the Middle East (but see Jamali & Mirshak, 2006; Kusku & Fraser, 2004). Moreover, there are very few comparative studies focusing on different stages of economic development countext (but see Robertson, 2009). Therefore, the U.S., South Korea and Turkey were selected as the focus of this research. These three countries are representative of a highly-developed economy (U.S.), a developed economy (South Korea) and a rapidly developing economy (Turkey) and they present opportunities for analysis on CSR website reporting.